Mview window borders, construction lines, & projected mview. Task 16. Mview window borders, construction lines, & projected mview. The Mview windows need to be moved to allow the images of the box to align in true projected fashion. This task will position the relevant corner of each box image using the Endpoints of the two construction lines drawn in task 15. To move the image, the Mview window itself has to be picked. Ends, Centers, and Midpoints can still be picked on the box image for use as alignment datum’s. If necessary, the Mview window borders can overlap. See Fig Tsk 16. 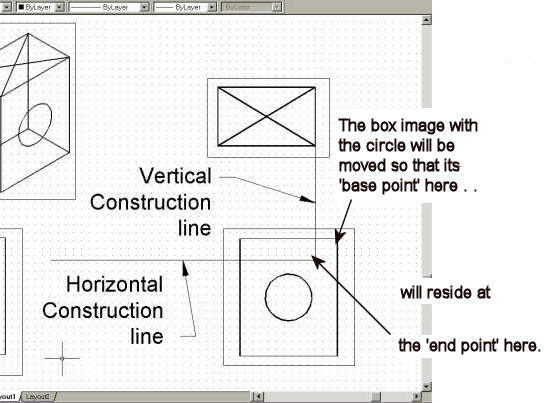 Repeat this task for the remaining projected Mview window, (the one that has the box image with the rectangle on its face), using the left end of the horizontal construction line. When the window with the rectangle aligns to the left of the window with the circle, erase the construction lines drawn in task 15. The views are now aligned in true projected fashion. Save your work as you usually would for a 2D drawing. Fig Tsk 16. View alignment to the construction line.